Perhaps the most controversial film in recent memory, this year’s annual Seth Rogan flick, The Interview, was finally released in theaters, alongside its day-and-date VOD release. Amid speculation about who is responsible for the initial Sony leak, after viewing the film, it is pretty clear as to why the hackers would find the film objectionable. 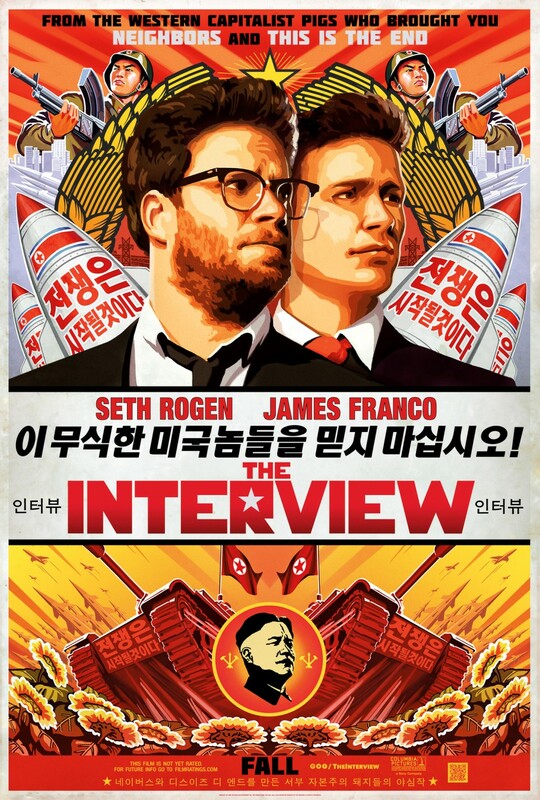 In addition to an often excessive satirical portrayal of Kim Jong-Un, The Interview seems to emphatically support the idea of a full scale civil uprising to topple the existing regime in North Korea; something that the Sony hackers explicitly stated they are trying to avoid in their demands to the corporation. Though it is impossible to divorce the movie from the media frenzy that overtook it, The Interview is a fine comedy, offering enough laughs to satisfy any fan of the Rogan-Franco bromances of the past. The film centers around the charismatic but dimwitted Dave Skylark (James Franco), the host of a TMZ style celebrity interview show, and his producer Aaron Rapoport (Seth Rogan). In order to help Aaron reach his aspirations of being taken seriously as a journalist, Skylark agrees to interview the leader of North Korea, coincidentally a fan of his show. Things become complicated for the pair when they are approached by the CIA to turn their visit to North Korea into an operation to assassinate Kim Jong-Un (Randell Park). The film plays out in a familiar manner for those familiar with other Rogan/Goldberg collaborations, full of sight gags, crude jokes, and ridiculous situations for the protagonists to navigate. And for the most part, the formula works. The clever jokes outweigh the bad ones, and bits between characters usually ended in laughter from the audience. Unfortunately, the only aspect of the film that doesn’t play well are the actual interactions with Kim Jong-Un, who is too unbelievable, even for the ridiculous world of the film. The numerous scenes portraying the North Korean leader seem more likely to produce groans than laughs, as most of the jokes fall flat between the two excessive personalities of Kim and Skylark. That being said, the abundance of humor in the rest of the film is enough, in my mind, to redeem the few blatantly unfunny moments in the movie. Surprisingly, the film actually offers more than just cheap laughs and controversy for the viewers. Unlike many blockbuster comedies, The Interview is set apart by truly impressive cinematography throughout. In addition to the host of effective and well constructed sight gags, the film has some really striking shots of what is meant to be North Korea, and comes together as a very aesthetically pleasing product. Even after all the hype and controversy, The Interview remains a solid and thoroughly enjoyable comedy. While not a standout by any means, if you’re looking for a low-brow, big-laugh film to watch over the Christmas holiday, The Interview is worth your time.